At our workshop we do all types of repairs and restoration of stringed instruments and we have an extended knowledge in sound adjustment and in handling of higher priced old instruments. 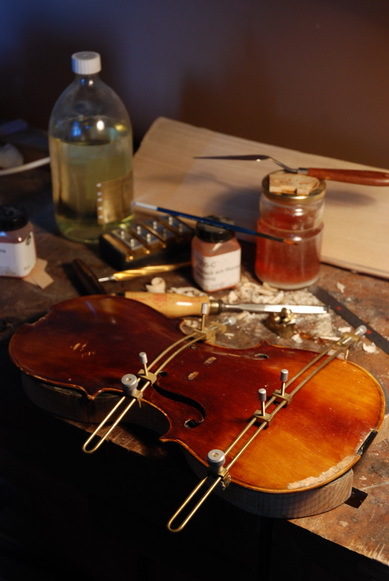 Daniel's experience of more than 25 years in violin making and restoring enable him to repair most of the string instruments of value in his country. Our credo is that repairs, and even more so, restoration of instruments should be done as conservatively as possible and with highest respect for authenticity and character of the instrument under repair. Work should be done precisely and the traces of such work should not be visible. This is a service that is often given less importance by the violin makers, but is taken very seriously in our workshop. We offer service of the highest level and have variety of top class horse hair. Special effort is made to always have fresh horse hair on stock. Bow rehair usually takes one to two days to complete. Same day rehair is also possible, but appointment should be made in advance. Please, call us for further details and check our Advice chapter on maintenance.